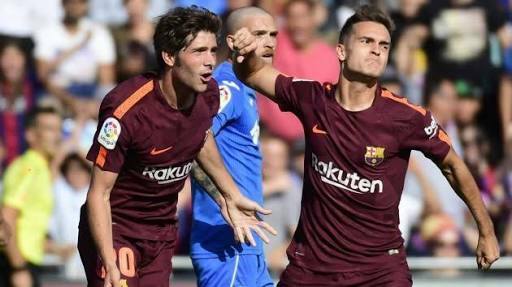 The Spain international midfielder made his 40th appearance for the Catalan giants on Saturday, triggering another payment in his 2013 transfer. Manchester City are due another €800,000 payment from Barcelona as part of the deal which took Denis Suarez to Camp Nou. Having spent two years in City’s academy system, the 23-year-old returned to his homeland in 2013 on a four-year contract. He cost Barca €3.2 million at the time, with a number of clauses included in the transfer intended to benefit City if the midfielder prospered. Suarez made little impact in Catalonia during an initial spell, as he was sold on to Villarreal in 2015, but was re-signed in the summer of 2016. The terms of his move from City still stood once back at Barca, and he has gone on to become a first-team regular. He took in his 40th appearance for the club against Getafe on Saturday, meaning that another payment was triggered. City are set to receive €800,000 for every 10 outings Suarez takes in up to 100 games. That means that Barca have currently paid out €6.4m for the Spain international, but the deal could end up costing them €11.2m. They will happily stump up the cash, though, if Suarez continues to make the impact he did at Getafe. Suarez stepped off the bench to influence a tight contest, with his equaliser just past the hour mark getting Barca back into the game before Paulinho snatched a late winner. Meanwhile in the UK, Manchester City stormed to a 6-0 victory over Watford on Saturday afternoon , to go top of the Premier League table.